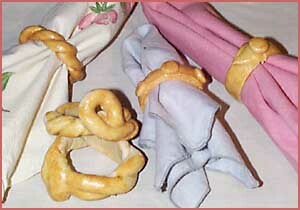 Use Baker's Clay to sculpt unique napkin rings! A cardboard tube (paper towel or toilet paper) will work well for a mold for napkin rings. Cover the tube completely with aluminum foil. Roll pieces of dough into ropes, each 1/4 inch thick and 12 inches long. Fold each in half and form a twist. Wrap around the tube, dab ends with water, overlap and press to seal. Bake at 300 degrees until set and golden (1/2 hr to 1 hr) and glaze with a beaten egg to give them a golden color. When done, slip off tube and cool. Another interesting napkin ring idea is to roll out dough into flat strips, 6 inches long, 2 inches wide and 1/4 inch thick. Wrap around tube and seal ends as above. Decorate with dough "fruit". You can make a cluster of grapes by rolling small dough balls. Attach one at a time to napkin ring by "scoring" (making small scratches in surface), brushing with a little bit of water and pressing pieces gently together. If you're ambitious enough to want to try roses or some other complex decoration, you might want to bake your decorations separately, then attach them to the finished napkin rings with glue.